With the daily boat trips you can enjoy the sun and the sea at unspoiled bays. There will be only your family and your friends. 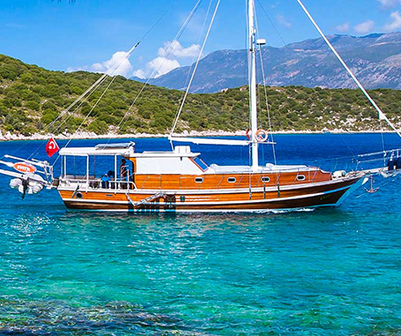 Please visit www.boattripturkey.com for more information. We board MS. Gulsah 1 boat at 10am and set sail. We go straight to a tiny bay where you can snorkel, swim, and enjoyed the kayak. We offer tea, wine or any refreshments you require. Then we set sail for Beehive Island. You can enjoy using the aqua sub here again the kayak will be put to use. After that we set sail for a quieter spot for lunch. Our trained hotel meze chef prepares delcious lunch on board whilst Ergun sets up his BBQ and cooks fresh fish, chicken kebabs or meat balls for everyone. Even if you are vegetarian, you can have a varied and amazing selection of food for lunch.